ATHENS, Ga.— Saturday is senior night for the Georgia Bulldogs with Georgia Southern coming to town to close out the home portion of the 2015 regular season schedule. 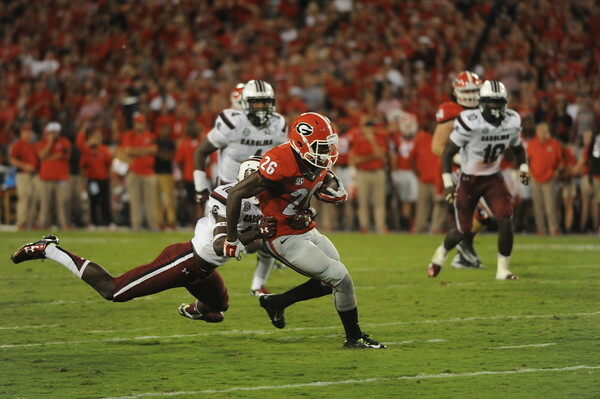 30 Bulldogs will dress in the red jersey’s for one last time inside Sanford Stadium. On this list of players are wide receiver Malcolm Mitchell, outside linebacker Jordan Jenkins, defensive lineman Sterling Bailey, offensive tackles Kolton Houston/John Theus and running back Keith Marshall. Marshall is a junior eligibility wise, however he let it be known to head coach Mark Richt that he wants Saturday to be his final game on the home field. So far this season, Marshall has 49 carries for 255 yards with three touchdowns. He missed most of the 2013 season with a torn ACL in the Tennessee game and played very little last season while trying to recover from injuries. Marshall was counted on to be a key contributor to this team early on in his career, much like Malcolm Mitchell. Like Marshall, Mitchell also had to deal with a torn ACL during his Georgia career. We’re all aware of Mitchell’s growth since coming to Georgia, with his love of reading being discovered while recovering from the knee injury. It of course has brought about many positive contributions to others. Mitchell admits that he’s grown since arriving in Athens. Mitchell is already a published author and will try to play in the NFL. However, he would like to do more writing in the future. If this team does win their final two games of the regular season and the bowl game, then they will win 10 games for the third time in the career of these seniors. After the season is over and the bowl game has been played, the Georgia Bulldogs will still be represented in a prestigious bowl game. Wide receiver Malcolm Mitchell and outside linebacker Jordan Jenkins have accepted invitations to play in the Senior Bowl this January down in Mobile, Ala.
Last year, the Bulldogs were represented by inside linebacker Amarlo Herrera. The year prior, tight end Arthur Lynch and quarterback Aaron Murray were invited down. Murray sat out while recovering from his late season torn ACL. Mitchell for one, is excited to get another game in before the draft process kicks into full gear. The Senior Bowl takes place during the week before the Super Bowl and allows for NFL teams to meet with the players. You will see coaches, scouts and general managers lining the sidelines of Ladd-Peebles Stadium to watch both teams practice all week. More players are expected to be announced and that means that other Bulldogs could be invited to Mobile. Georgia’s 20-13 win over Auburn last week might have given the Bulldogs a better look at a higher profile bowl game come the postseason. They currently sit at 7-3 on the season and will increase their chances of getting to a better game with two more wins. SportingNews.com: Buffalo Wild Wings Citrus Bowl vs. Michigan State on Jan. 1.